A field is where you enter your content into GatherContent. There are 5 different field types available to add to your template, and they're added to your items structure or template. You can add guidelines to a field to provide instructions as an author writes content, as well as a whole field dedicated to them where more general instructions are needed. Most of your content will be added to a text field. You can also collect files (such as images) via an asset field, or information such as a category for the page via either radio buttons or checkbox fields. Projects are made up of a number of items. Each item is a piece of content, and normally reflects a page on a website. They can also be an article in a blog, an email in a campaign, although primarily GatherContent is used for website builds and redesigns. In some circumstances, an item can also reflect a component on a web page. The above project has 6 items on display. 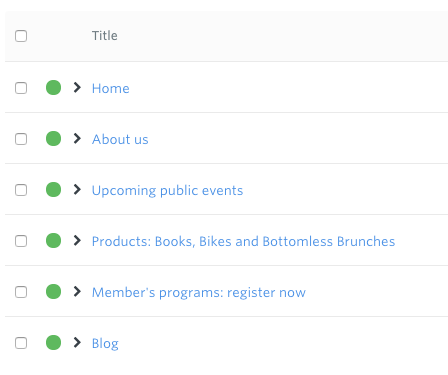 Within GatherContent you'll see all of your projects. 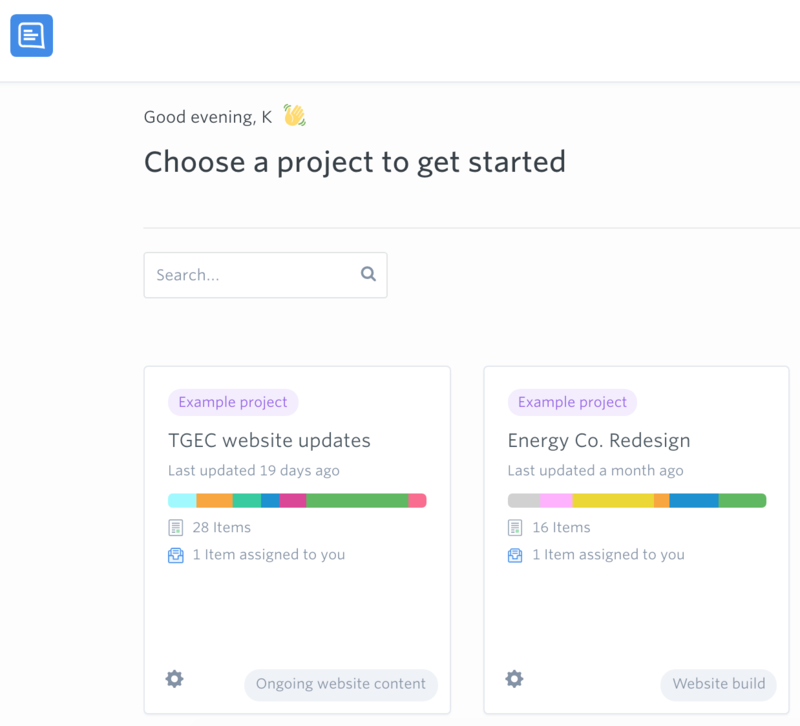 Each rectangle on your project dashboard is a project (in the example dashboard below, there are 2 projects) and each project is effectively a bucket of content. Items will need a structure or template applied to it before you can add content. A structure is a collection of fields which make up the item, and is applied to one item. A template is a structure which can be used across multiple items, and is a great way to ensure that your content is consistent across a series of pages, such as employee bios or products for your e-commerce store. Copies of these can be imported between projects, so you can use a template you've built in another project as a starting point. 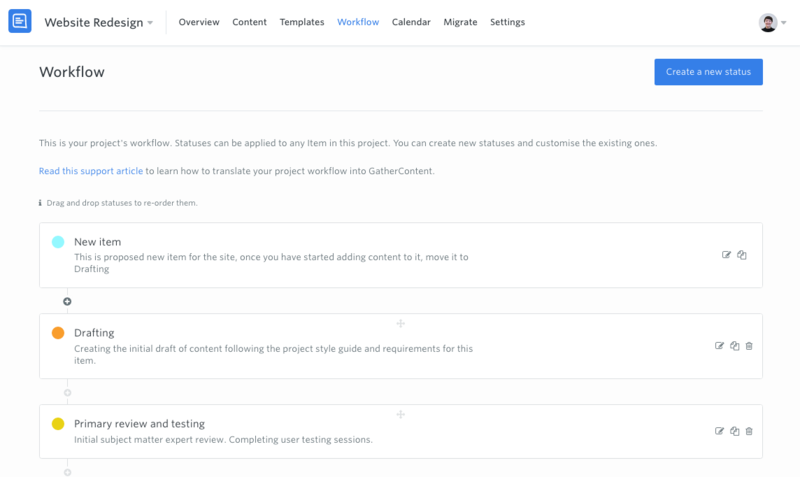 The workflow is a collection of workflow statuses. Each item has a workflow status applied to it. This allows you to keep a track of where that item is in the production process. Each status should represent a phase of work that the item will go though, such as "Editing". This means everyone who has an interest in the item is able to see exactly what is happening with that item, as well as what's left to get the item published. An item or project is counted as active when it isn't archived. These count towards the plan limits for projects & items. You can archive an item or project when you've finished working on it. These archived items and projects don't count toward the plan limits, and can be restored back to your account dashboard or Content tab if you need.